We looked at what you need to do help your frontline teams get prepared the GDPR and new Data Protection Act a few weeks ago (www.linkedin.com/pulse/week-19-gdpr-customer-experience-frontline-part-1-steve-sullivan/). So, by now you will ideally have agreed on an approach and the content you will use to inform and up-skill those teams – the public face of your organisation’s customer experience. for the first time. And even if training for data protection isn’t a new task, you are probably having to consider additional right, additional data protection-related customer contacts and significantly changed processes. So, job done? Well, no, not really. Lots of organisations are focused on the magical 25th May date. But that’s the starting point not the finishing line. 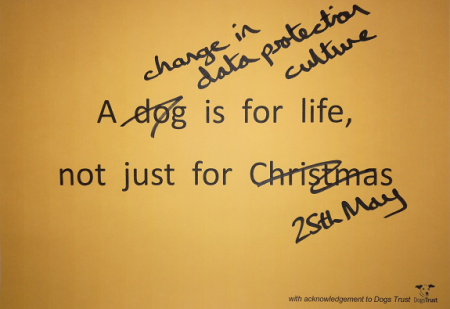 Customer data protection rights, responsibilities and perceptions are changing radically – and for many organisations that will require a real culture change. A one-off training session won’t deliver that. The benefits of a flexible and intelligent learning management solution or platform are well known. These tools can give you increased flexibility to develop and refresh content, to assess learning and understanding, ensure consistency across the organisation, include different media (show people what to do on the CRM system when they receive a Subject Access Request), allow your colleagues to self-service their learning and so on. If you haven’t investigated the benefits of investing in a learning management solution, maybe now’s the time to do so.